Advance Media New York has partnered with The Job Network to reach active and passive talent on the largest recruitment ad network in North America. With more than 2,000 sites, (across national, niche and local job boards), our clients can hire faster, smarter and for less cost with programmatic job postings that do it all. Post unlimited job descriptions, and company information. Reach active and passive candidates through social media, email and resume matching programs. Invite diverse candidates, and college/entry level candidates to apply. Brand their company and jobs in the Featured Employer and Featured Jobs sections. Receive resume candidate matches right in their account (no more searching through resume databases). 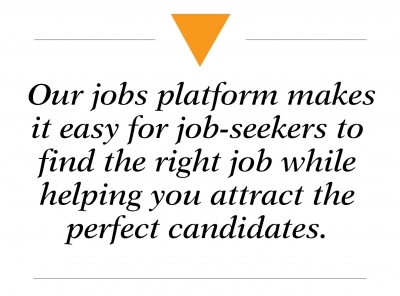 Targeted digital ads and content (articles, videos, infographics, etc) find both active and passive job seekers online. Paid Search (Pay-per-click) SEM and Search Engine Optimization (SEO) strategies build your company’s recruitment marketing plan. Email Marketing campaigns target prospective employees. Social Media Recruitment campaigns connect and engage users of Facebook/Instagram, and Twitter. Our print programs feature display advertising opportunities in The Post-Standard careers section. Nielsen lists The Post-Standard as one of the top ten, best read newspapers in America, based on market penetration. Companies can rely on our expertise to reach candidates in any or every part of Upstate New York: Buffalo, Rochester, Syracuse, Utica, Albany, the North Country or the Southern Tier. Recruiters seeking job seekers across the country or around the world can take advantage of our experience managing digital marketing tools custom built for advertisers in hundreds of different industries. To learn more about our recruitment solutions, contact a digital marketing consultant today. Learn what our recruitment solutions can do for your business.